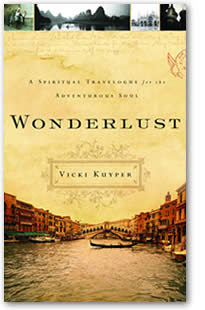 Wonderlust: A Spiritual Travelogue for the Adventurous Soul is one of the more unique devotional books that I have ever come across. It is written by a woman who has traveled more than any other person I have ever heard of (excepting perhaps presidents and heads of state). Vicki Kuyper has traveled to Cambodia, Russia, France, Italy, Austria and a number of other places. She never travels alone, and is always in the company of relatives, friends and, most importantly- God. Along Inca trails and atop elephants, God speaks encouraging words to Kuyper's heart and she shares those messages within the pages of this book. Kuyper is an interesting woman who has been a lot of places and sees a lot of things. It is obvious that she takes to heart the sights and sounds that she takes in and personalizes adventures in such a way as to make practical her application of scripture. She is stead faith in faith, persevering in difficulty, honest in her affliction and just downright fascinating. I like the way this book reads both like a devotional and as a travel journal. For example, she opens by the book by speaking of her difficulty climbing an old Inca trail in Peru. Kuyper talks about a journey of self acceptance to realize God made her a certain way and He only expects her to take one step at a time up the mountain. She might not have raced up the mountain, but she got to the top because she was obedient in inching forward. I know I can frequently become irritated because things are not happening and developing in my life as fast as I would like them to. This story was a good reminder to be patient and wait in the Lord and on His timing. The whole book is filled with stories just like these and I find them imaginative and fresh. This is definitely a unique book and one I feel like I can heartily recommend. 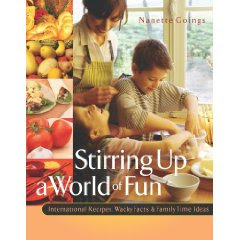 The same publisher (New Hope) also offers a quirky and fun title called Stirring Up a World of Fun: International Recipes, Wacky Facts and Family Time Ideas . This recipe and idea book is pretty cool. Each recipe is marked with a symbol to tell you whether or not it can be made by the children alone or whether or not it will require adult assistance (or made by adults alone). Then the book just takes you around the world on a plate! To describe this book, let's take for example the recipes for Thailand (my new sister-in-law just returned from spending about 4 months there). First the book gives you some history of Thailand and tells you were it's located. It talks about the tsunami that struck in December 2004 and encourages discussion between the family as to what you all might do in the case of emergency. It prompts you to talk about natural disasters and how you and yours might be helpful in providing assistance or solutions to community (and sometimes global) problems. The book then follows up with appropriate scriptures and provides two recipes for the family to make and enjoy together (Khao Phat and a Sticky Rice and Banana Treat). I've never seen a recipe book quite like it and I wasn't sure what to expect from the title. However, the content seems solid, informative and fun. For something a little out of the ordinary (esp. for families who can't travel to many exotic places at this point in their lives), you might want to give Stirring Up a World of Fun some consideration. I think we'll work our way through this book when we're older and working on world geography projects. It looks like it could provide some fun food family adventures with interesting discussions. P.S. And never you fear! This recipe book is not all together exotic. You can also explore the United States with this book, sampling the best - like Apple Pie and one of my favorites - chili. Apparently there's some debate over where chili originated. Some people say Mexico while others think chili made its first appearance in Texas. (I grew up in Texas which might explain why I love it so much!) This book quotes the Mexican Dictionary (1959 edition) which describes chili in the following manner: "A detestable food passing itself off as Mexican, sold in the US from Texas to New York." Let the debate continue! I don't care where it originated so much as I care that it does exist and I can continue to eat and enjoy it!